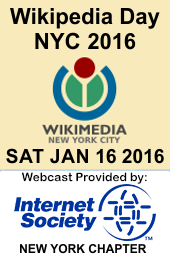 On Saturday January 16, 2016 Wikimedia NYC will celebrate Wikipedia’s 15th Birthday with a miniconference, hosted by NYU’s Interactive Telecommunications Program at the Tisch School of the Arts, supported by the Free Culture Alliance NYC (including ISOC-NY). Topics include Wikidata, Education & Editathons, Lightning Talks, and many inconference sessions. From 4pm-5pm there wil be a live link up with some of the many other similar events taking place worldwide. Attendance is free. Food will be provided. Please register at http://bit.ly/wikiday15 if you plan to attend in person. There will also be a livestream via the Internet Society Livestream Channel. What infrastructure is needed for positively disruptive technology? Infrastructure in this sense could be physical (fiber in the ground) – or open source software, legal/policy, etc. – more broadly any type of support structure. This will be the beginning of ongoing initiatives to address the issues raised and follow with hackathons afterwards. A major component will be the development of standards and protocols for new Net-connected technologies with consideration of the social and ethical issues as machines become intelligent. We’ll also explore innovative funding methods for these projects using digital currencies. Teachout is a constitutional and property law professor at Fordham Law School. She is a deeply experienced leader in the fights for economic and political equality and against concentration of wealth and control in the hands of the few. She is one of the leading legal experts on corruption. Timothy builds on Free Press’ grassroots and policy work to promote universal access to open networks and protect free speech everywhere. Before joining Free Press, Tim served as executive director of MediaChannel.org and as vice president of Globalvision New Media. He has also worked extensively as an editor, reporter and photojournalist for the Associated Press, Time, Inc., the New York Times and Australia Consolidated Press. Tim critiques, analyzes and reports on media and media policy for the Huffington Post. Wireless Engineers predict 50x improvement in capacity; How do we make it so? Spectrum should be WiFi and less licensed. WiFi wiil do more and more, becoming increasingly crowded. Mobile carriers, using existing spectrum, can increase their capacity using MIMO and more with little or no increase in capex. Logical policy: All newly available spectrum go to WiFi/unlicensed. Sander Rabin, a physician-attorney, is the executive director of The Center for Transhuman Jurisprudence, a not-for-profit organization whose mission is education in human enhancement and the development of policies and model rules of law for human enhancement that protect our rights to our minds, bodies and genomes, while minimizing human enhancement’s potential for divisiveness and harm. Goodnik has developed a labor-backed digital currency for information workers to share resources with non-profits and for-profit companies with a social mission. Nate has been working as a manager of and consultant to non-profit and technology related companies for 20 years. Nate also founded GrassrootsCamp, an organization that provides free training seminars to non-profit organizations and social entrepreneurs. It is from that experience that Goodnik started as a way to broaden the impact of those events and ideas from that community. Nate holds a BA from St. John’s College in Annapolis, MD and a J.D. from Fordham University School of Law where he was a Crowley Fellow in International Human Rights and a Stein Scholar for Public Interest Law and Ethics. • Margaux Avedison, Moderator. Co-founder of EvotionMedia, a “Crypto-Media” production and finance entity. She is on the advisory board of the Bitcoin Shop and organized the first Bitcoin Education Day on Capitol Hill as an Advisor for the Chamber of Digital Commerce.She also consults for banks, individuals, large corporations and venture capitalists on Bitcoin and Blockchain 2.0 technology. She is an early entrepreneur in the digital currency space and relaunched the first American Bitcoin Exchange, Tradehill, in 2012. • Attorney Jeffrey Alberts, Partner in Pryor Cashman’s Litigation Group. Head of the firm’s White Collar Defense and Investigations Practice. Jeffrey’s practice focuses on government investigations and prosecutions and related regulatory proceedings, asset forfeiture and money laundering litigation, victims’ rights representation, and complex civil litigation. Jeffrey is an experienced trial lawyer who has served as lead counsel in numerous trials, including civil and criminal federal jury trials, state jury trials, and state and federal bench trials. Jeffrey has represented clients in disputes involving virtual currency. He also has been quoted by the media concerning criminal prosecutions of virtual currency service providers and government seizures of bitcoins. Immediately prior to joining the firm in 2013, Jeffrey spent six years as an Assistant United States Attorney in the Criminal Division of the U.S. Attorney’s Office for the Southern District of New York, where he investigated and prosecuted a wide variety of white collar criminal offenses, including money laundering, securities fraud, bank fraud, mail and wire fraud, and bankruptcy fraud. • Adam Krellenstein, Co-founder Counterparty. Lead developer of counterpartyd; chief architect of the Counterparty Protocol. Counterparty is a free and open platform that puts powerful financial tools in the hands of everyone with an Internet connection. By harnessing the power of the Bitcoin network, Counterparty creates a robust and secure marketplace directly on the Bitcoin blockchain, extending Bitcoin’s functionality from a peer-to-peer payment network into a full fledged peer-to-peer financial platform. Patrick Deegan CTO, ID3 Chief Architect. ID3 is developing a new social ecosystem of trusted, self-healing digital institutions. This endeavor seeks to address the severe structural limitations of existing institutions by empowering individuals to assert greater control over their data, online identities and authentication. This panel discussion will explore the world of NUI and what it will take to move today’s emerging NUI technologies (voice recognition, Kinect, haptics, facial recognition, etc.) into widespread adoption and make them accessible to all. Deb Benkler, Moderator. Co-founder of NUI Central – NY, the largest NUI group on earth and is known as NYC’s leading NUI evangelist. She is a practitioner of lean and logical UX focusing on best practices in the broader context of CX (customer experience). In 2012, she won a User Experience Award for her work on the Maryland Transit Administration Interactive Maintenance Kiosk, which incorporated facial recognition. Ken Lonyai Co-founder of NUI Central and is known as the other NYC leading NUI evangelist. He’s a 15+ year veteran of user centered interactive project development including some of the industry’s most unique experiential systems. His skills span the on-line world and nearly every realm of human/computer interface used by brands and retailers – mobile, interactive kiosks, experiential displays, etc. He is a User Experience Award winner. David Melville is a Research Staff Member at IBM. He has worked in the area of semi-conductor fabrication and nano-technology, exploring meta-materials and techniques for optimizing illumination and patterning masks for photo-lithography processors before making a jump to developing visualization and interactivity solutions for smart-grid projects. Most recently, he has been exploring what it means to interact with learning systems and working to establish a new era of computing experience. Sean Montgomery is head of hardware at Ringly, the first fashion ring to manage your mobile device. He’s an engineer, professor, and new-media artist in New York City. While finishing his Ph.D. in neuroscience, Sean began to consider the fact that from the perspective of a neuron inside the human brain, both a cold winter day and the embrace of a loved one feels like a sequence of electrical impulses. Sean co-founded SENSORSTAR Labs, an agile R&D consulting group in New York City. Tanya Kraljic is a Principal Designer for Nuance’s mobility division. Her work focuses on the strategy and design of speech experiences in mobile, wearable, in-home, and other emerging technologies. Prior to joining Nuance in 2010, Tanya earned a PhD in cognitive psychology, with an emphasis on adaptation in interactive spoken dialog. The Internet Society’s New York Chapter (ISOC-NY) and the New York Technology Council (NYTECH) will join the Public Interest Registry (PIR) in presenting a midday symposium “Mitigating DDoS Attacks: Best Practices for an Evolving Threat Landscape” in New York City on December 5 2012. Participating organizations include Afilias, Google, Neustar, M3AAWG, Symantec, EFF, and De Natris Consult. As a public service PIR are generously covering the $99 fee for all attendees – thus registration is free! The event will be webcast live via the Internet Society Chapters Livestream Channel. Distributed Denial of Service (DDoS) attacks are an all-too-common reality in today’s Internet landscape and are an escalating global problem. Whether a DDoS attack is motivated by criminal intent, like cyber extortion, or is executed as an extreme form of free expression, the resulting service interruptions can have wide-ranging effects. This program will address the motives behind and targets of DDoS attacks. It will also explore the various ways attacks are carried out, as well as mitigation techniques and the risks of “unintended consequences.” The goal is to foster a discussion and provide a platform for developing a framework of best practices to mitigate DDoS attacks. On Thursday November 15 2012 the Internet Society’s North American Bureau in collaboration with its New York Chapter (ISOC-NY) will present INET New York: An Open Forum on The Copyright Alert System – a half-day conference at New York Law School. Public advocacy organizations and Internet users will have the opportunity to participate in a multistakeholder dialogue on key issues relating to the Copyright Alert System (CAS) – sometimes called the 6 strikes program, and due to kick off on November 28 2012 – with representatives and members of the Center for Copyright Information (CCI) which is administering the system. Registration is now open (free), and you can also ask questions in advance, via the links below. It is not necessary to register for the webcast, but you can via our meetup group. The 6th annual global OneWebDay celebration will be Thursday September 22 2011. ISOC-NY’s contribution will be to host respected computer scientist and Internet iconoclast Bob Frankston who will present on the theme “Infrastructure commons – the future of connectivity”. The subways, roads and sidewalks are vital infrastructure. The Internet should be no different – our economy, health and safety depend on our ability to communicate. Yet its provision and economy are based on outdated, inequitable, and inefficient telecom models. How do we move to a connected future? Who: Public welcome. In person or by webcast. We are happy to also announce that Dave Burstein of DSL Prime has agreed to moderate the session. Dave will also talk about the practicalities of establishing community networks. ISOC-NY will have a planning meeting on Jun 14 2010. We will be welcoming ISOC North American Regional Bureau Manager Sally Shipman Wentworth. Sally is representing the Internet Society in planning for a Broadband Internet Technical Advisory Group (BITAG) so we are sure to have plenty to talk about. We intend to webcast this meeting live so that other North American Chapters can participate. Who: All are welcome. Come along for a chat! A joint effort by the both the Art Law and the IP Law Societies at Cardozo School of Law, this Feb. 24 2010 panel set out to consider the implications/possibilities of the Google Books Settlement model as applied to the music industry. On Jan 14 2010 the newly formed New York Technology Council held its second public meeting in the form of a panel discussion on the topic “Technology Trends for 2010“. Representatives of Google and Microsoft were joined by City Council member Gale Brewer to pontificate on what the new year might bring. Audio is here. Video is below. On Jan 20, the American Society of Journalists and Authors (ASJA) , the National Writers Union (NWU), and the Science Fiction and Fantasy Writers of America (SFWA) and the Internet Society’s New York Chapter (ISOC-NY) jointly sponsored a workshop to discuss the implications for writers of the proposed Google Books Settlement (GBS), which is the result of a class action brought by the Authors Guild. There is some urgency, as writers only have until Jan 28 2010 to opt out or object. The three sponsoring writers organizations above all oppose the settlement. A fairness hearing has been set for 18 February. New York, NY – On Wednesday, December 16, 2009 at 10 AM in the Council Chambers of City Hall, the New York City Council Committees on Technology in Government and Small Business held a joint public hearing to examine how small technology start-ups are surviving in this tough economy. This hearing will help the Council understand the dynamics behind successful firms as well as what options are available to the City in aiding these important businesses in their struggle to remain competitive and viable in a global environment. Archived webcast and the twitter feed are embedded below.